Metropolis is Tokyo’s long-running English weekly events and features magazine. 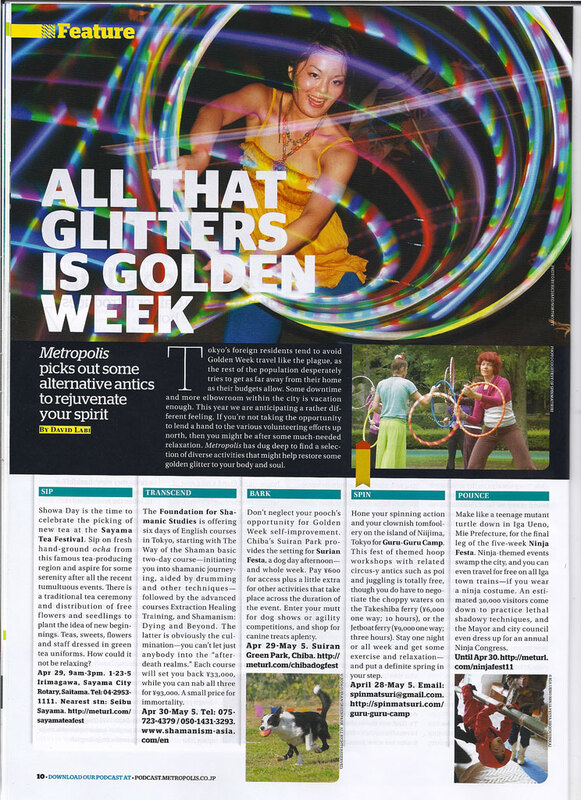 This week, Guru-guru Camp is part of their roundup of fun things to do during the Golden Week holiday. Not only did we get a plug, but we got the cover of the magazine. Sareh is grinning wildly while fire hooping on the beach last summer in this photo by Richard Northcott. Hone your spinning action and your clownish tomfoolery on the island of Niijima, Tokyo for Guru-guru Camp. This fest of themed hoop workshops with related circus-y antics such as poi and juggling is totally free, though you do have to negotiate the choppy waters on the Takeshiba ferry (¥6,000 one way; 10 hours), or the Jetboat ferry (¥9,000 one way; 3 hours). Stay one night or all week and get some exercise and relaxation—and put a definite spring in your step. I wonder if this will bring anyone new to camp next week? Don’t forget that non-spinners are welcome, too, so bring your friends. Camp starts on Friday morning!